Rapturous love's greeting of realer, of rounder replies?" My name is Matthew Knight, a Roman Catholic seminarian for the Archdiocese of Portland in Oregon, studying in the SF Bay Area. 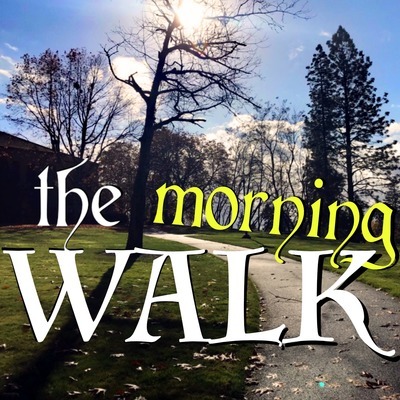 Come take a walk with me as we discuss life, faith, liturgy, priestly formation, poetry, philosophy, theology, and a whole lot more! Podcast updated weekly on Sundays. 2 December 2018 | First Sunday of Advent | Menlo Park, Calif. And so we come around again to the beginning of another liturgical year. The season of Advent is a graced time to reflect on the awesomeness of God’s providence, His will which orders all of creation, and how well I am submitting myself to that will. “True humility is to listen to what God wants, and then do it,” says St. John of the Cross. Let this Advent be a true season of renewal of our trust in the Lord, that He will do all He has promised! Opening music: “Air: But who may abide the day of his coming,” Messiah, Part One, composed by George Friedrich Handel, performed by the Choir of King’s College, Cambridge, 2010. All rights reserved. 25 November 2018 | Our Lord Jesus Christ, King of the Universe | Palo Alto, Calif. Hunger is something you can’t help but experience: not just occasionally, but over and over again, like an alert on your phone you can snooze, but never dismiss. No matter how good your Thanksgiving dinner, you’ll be hungry again the next morning (if not rummaging for a turkey and stuffing sandwich at midnight!) But does this relentless demand of our bodies for food reflect anything about the needs of our spirit? That’s right: it’s time to talk about our hungry hearts. (Opening music not provided by Bruce Springsteen.) Opening music: “Ave verum corpus,” composed by William Byrd, performed by the Tallis Scholars, 1993. All rights reserved. 18 November 2018 | 6th Resumed Sunday after Epiphany | Menlo Park, Calif. What is the role of women in the Catholic Church? What about the role of the priest? How can we reach young people? How do we proclaim God’s saving truth in a secular culture? And how does the liturgy fit into all of this? Join me and a friend this week as we talk about all of this and more over a cup of tea! (Note: Tea not included. For optimal enjoyment, make yourself a cup before listening.) Opening music: “Gloria in excelsis Deo - Allegro," Missa in Angustiis (‘Lord Nelson Mass’), composed by Joseph Haydn, performed by the English Concert and Choir, 1988. All rights reserved. 11 November 2018 | 5th Resumed Sunday after Epiphany | Menlo Park, Calif. It's 11 a.m. on 11/11 -- traditionally (think medieval tradition) the first day of winter, although you wouldn't know it on this sunny day in the San Francisco Bay! After a month or more on hiatus, the podcast is back with reflections on my institution as lector last week, the unique nature of ordination and the Catholic priesthood, and the number one thing which annoys me more than ANYTHING! But you'll have to listen to the whole show to learn my secret weakness... Opening music: "Dirait-on," movement V. of 'Les chansons des roses,' composed by Morten Lauridsen, performed by the Chamber Choir of Europe, 2009. All rights reserved. 1 October 2018 | St. Thérèse of the Child Jesus and the Holy Face | Menlo Park, Calif. Why am I driving down Highway 101 in the dark at 6:00 in the morning? Because it's my sister(-saint)'s feast day, and I have to be with the rest of the family for Morning Prayer and Mass, that's why! Join me and St. Thérèse on the road to chat about vocation, discernment, and the universal call to holiness. "My vocation is love!" — And so is yours! Opening music: "Bless the Lord," performed by *Ncense, 2008. All rights reserved. 23 September 2018 | 18th Sunday after Pentecost | Menlo Park, Calif. One of the hallmarks of the modern world is division. Conservative or liberal? Progressive or traditional? Sadly, some even go so far as to try to divide Christ from the Church—as if the Head were taking us one direction and His Body going the opposite way! But just as a living person's head can't be separated from his body (and hopefully you'll all take this on faith without trying to verify it yourself! ), Christ can never be separated from His living Body on earth, the Church. In this episode, I discuss how faith in Christ entails faith in the Church He founded, and how living out of this truth in simplicity and hope can help us overcome our own divisions to be a better witness to the world. Opening music: "Te Deum - Hymnus (tonus monasticus)," sung by the Benedictine Monks of the Abbey of Saint-Maurice & Saint Maur, Clervaux, Luxembourg, 1987. All rights reserved. 17 September 2018 | St. Albert of Jerusalem, Bishop, and Lawgiver of Carmel | Menlo Park, Calif. If you want to be a better athlete, you need an exercise plan. If you want to be a better student, you need a plan of study. So what if you want to be a better Christian—a holier (and therefore happier) son or daughter of the Father? What you need is a plan of God's love: a plan to know, love, and serve Him a little better each day. In this episode, I share my plan, and some advice for coming up with your own. Also: two elements which are essential if you want to advance quickly in the spiritual life; the one reason we puny human beings can know, love, or serve God at all (hint: it doesn't come from ourselves! ); and my response to a popular anti-Catholic myth... Opening music: "Laudes: Hymne - Puisqu'Il est avec nous," composed by Philippe Robert, performed by the Choeur des Moines de l'Abbaye de Tamié, Savoie, France, 2010. All rights reserved. 10 September 2018 | Monday in the 16th Week after Pentecost | Menlo Park, Calif. Long journeys make great analogies for the spiritual life. What are we supposed to do with hardships, detours, and delays along the road? When you have no money to pay the toll? What about when you're falling asleep at the wheel? Along those lines, let me tell you the story of my whirlwind weekend trip to Oregon and back for a friend's ordination this Saturday... Opening music: "Loving Shepherd of thy Sheep," arr. John Rutter (1991), performed by the Cambridge Singers and City of London Sinfonia, Cambridge, 2006. All rights reserved. 2 September 2018 | 22nd Sunday in Ordinary Time | Menlo Park, Calif. Let’s take a walk on the Eastern side of the Church (or at least of Menlo Park!) This morning, as I make my way across town to a Byzantine Catholic Divine Liturgy—more on that later—I want to share with you a bit about my first experience this year in ministry, as well as some thoughts about the right relationship between worship of God and service of the poor. Opening music: Excerpt from the Divine Liturgy of St. Basil the Great, sung by the parish community of St. Basil the Great Byzantine Catholic Church, Los Gatos, CA, 2018. All rights reserved. 26 August 2018 | External Solemnity of the Immaculate Heart of Mary | San Jose, Calif. We’re all aware of the scandals coming to light in the Church even as we speak. In this episode, I want to share my response to those scandals as a seminarian and son of the Church, as well as the fruits of a great spiritual conversation I had today with a good friend. “Since Our Lord has so few friends,” says St. Teresa, “let those few be good ones!” Opening music: “Salve Regina,” performed by the Friars of the Dominican House of Studies, Washington, DC, 2014. All rights reserved. 21 August 2018 | St. Pius X | Menlo Park, Calif. The show resumes after a long break and many changes. Featured in this episode: “What I Did With My Summer Vacation,” what I’m doing now that I’m back in school, and reflections on everything from sacred music to the Enlightenment, providence, and the love of God as the interpretive key for our lives. Plus, get lost with me in a new city in real time! All this and more on the other side of the play button. Opening music: “O Sanctissima,” arr. Kevin Allen (2013), performed by Matthew Curtis, 2014. All rights reserved. 6 March 2018 - Tuesday in the Third Week of Lent - Mt. Angel, Ore. - Part 2 Continuing where Part 1 ended, I discuss my early discernment with the Dominicans, my time as a postulant and novitiate in Carmel, and how God ultimately led me back to the Archdiocese of Portland. Hint: it’s all about desire (one above all!) Opening music: “Veni Creator Spiritus,” Sequence for the Solemnity of Pentecost, sung by Carmelite Sisters of the Most Sacred Heart of Los Angeles, Alhambra, 2016. All rights reserved. 6 March 2018 | Tuesday in the Third Week of Lent | Mt. Angel, Ore. After a long break (hey, I’ve been working hard — no time to walk and talk! ), the podcast resumes with some thoughts on discernment and desire, as well as discussion of my philosophy thesis: the relationship between poetry and philosophy, which seems to be about all I think about these days! This was a longer episode than usual, so I’ve broken it into two parts. The second will be available in a day or so. Opening music: “Veni Creator Spiritus,” Sequence for the Solemnity of Pentecost, sung by Carmelite Sisters of the Most Sacred Heart of Los Angeles, Alhambra, 2016. All rights reserved. 15 February 2018 | Thursday after Ash Wednesday | Mount Angel, Ore. “The time of penance has come, the time to atone for our sins and to seek our salvation!” Lent has begun, just as the days are beginning to get lighter, the cherry trees are starting to blossom, and the birds are singing in the branches. Coincidence? I think not… Opening music: “Miserere mei, Deus,” arr. Gregorio Allegri (1638), performed by King’s College Choir, Cambridge, 2011. All rights reserved. 30 January 2018 | Tuesday in the Fourth Week after Epiphany | Mount Angel, Ore. On this rare sunny morning under a cloudless blue sky, let’s talk about life on other worlds. C.S. Lewis’ Space trilogy can teach us something very important about our own spiritual life here on “the Silent Planet.” Opening music: “Alma Redemptoris Mater,” motet for four voices, arr. Palestrina (1604), performed by King’s Singers, Cambridge, 2016. All rights reserved. 24 January 2018 | St. Francis de Sales | Mount Angel, Ore. This semester, I’m blessed not to have any classes at 9:00 any day of the week, so I’m going for a daily run or walk—come hell or high water or fierce Oregon rains! I’ve also decided to start a podcast. I’d tell you more but I haven’t time just now. Would you like to go for a walk with me?